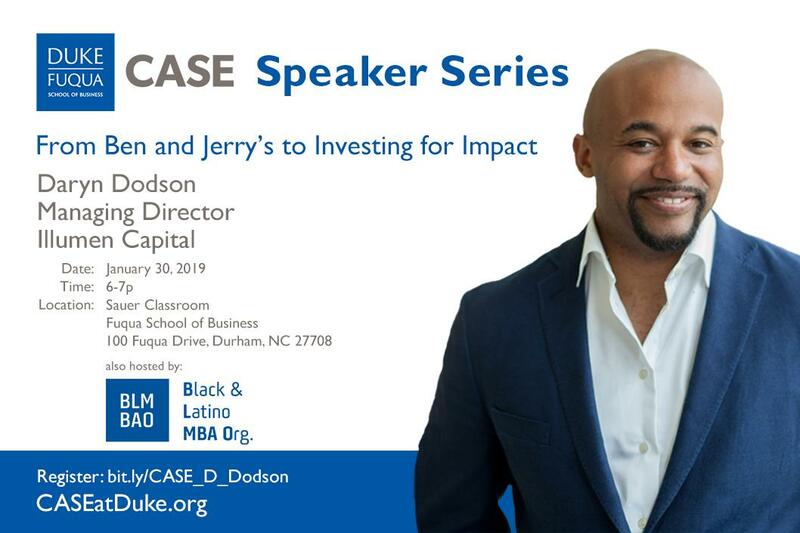 Join the Center for the Advancement of Social Entrepreneurship (CASE) & the Black and Latino MBA Organization at Duke University, as we host Daryn Dodson, Managing Partner of Illumen Capital and passionate advocate of social and economic justice, for an evening talk about how to use impact investing as a sharper tool for lasting change. Mr. Dodson is a former consultant to the board at Calvert Funds, $12 billion pioneer of the impact investing field, which maintains a portfolio of more than 40 funds on five continents. Mr. Dodson also currently serves on the Board of Directors for Ben and Jerry's and has been known to bring ice cream to his speeches, as well as talk about the ways that public companies can create impact. He recently founded Illumen Capital to seek out the world's best impact fund managers and take them through a rigorous process to reduce their implicit bias. His work with impact investors, private equity funds, Fortune 100 companies, universities and foundations has been viewed through the lens of addressing the world's most pressing social and environmental problems. He earned his M.B.A. from Stanford, where he serves on the Dean's Management Board, and his A.B. from Duke University.